Astrocytomas are the most common type of primary central nervous system tumors. They are frequently associated with genetic mutations that deregulate cell cycle and render these tumors resistant to apoptosis. STAT3, signal transducer and activator of transcription 3, participates in several human cancers by inducing cell proliferation and inhibiting apoptosis and is frequently activated in astrocytomas. RNA interference was used to knockdown STAT3 expression in human astrocytes and astrocytoma cell lines. The effect of STAT3 knockdown on apoptosis, cell proliferation, and gene expression was then assessed by standard methods. We have found that STAT3 is constitutively activated in several human astrocytoma cell lines. Knockdown of STAT3 expression by siRNA induces morphologic and biochemical changes consistent with apoptosis in several astrocytoma cell lines, but not in primary human astrocytes. Moreover, STAT3 is required for the expression of the antiapoptotic genes survivin and Bcl-xL in the A172 glioblastoma cell line. These results show that STAT3 is required for the survival of some astrocytomas. 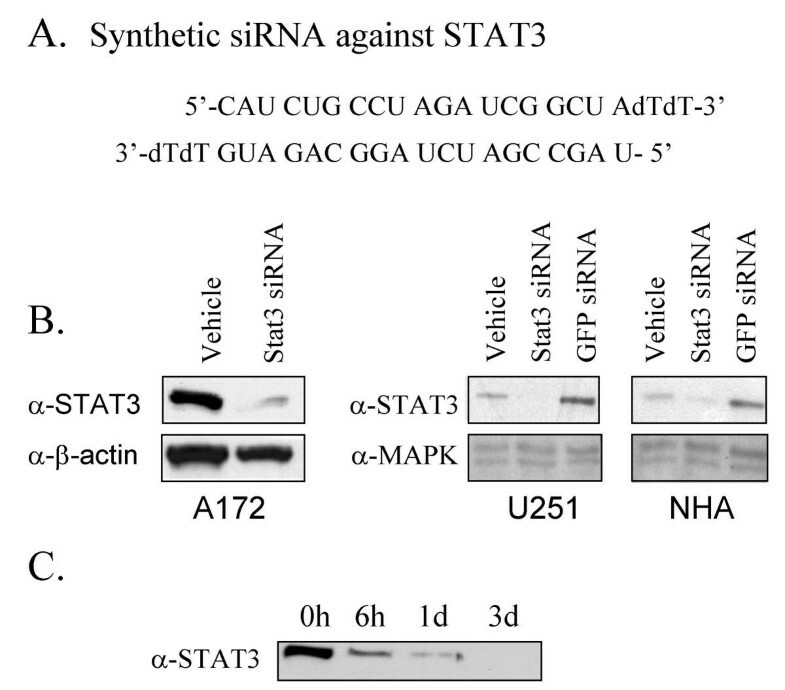 These studies suggest STAT3 siRNA could be a useful therapeutic agent for the treatment of astrocytomas. Astrocytomas are the most common type of primary tumors of the central nervous system. These tumors arise from either astrocytes or their progenitor cells  and represent the second leading cause of cancer related deaths in children and in young adults [1–5]. It is also the second fastest growing cause of cancer deaths among those over 65, and unlike lung cancer (first) and melanoma (third), no behavioral changes have been shown to reduce risk . Astrocytomas are divided into four grades based on the malignancy of the tumor. Glioblastoma multiforme (GBM), grade IV, is the most common type with the worst prognosis [1–5]. Average post-operative survival after tumor resection is less than two years [1–5]. In young adults, grade IV astrocytomas usually progress from lower grade astrocytomas, while in older patients it frequently arises de novo [1–4]. Progressive astrocytomas are frequently associated with loss of function mutations in p53, Rb and Ink4a/p16 genes as well as amplifications of PDGFR, MDM2 and Cdk4 genes [5, 7–13]. These mutations cause a deregulation of cell cycle and render these tumors resistant to apoptosis. STATs, signal transducers and activator of transcription, are a family of transcription factors that transmit signals from cell surface receptors directly to the nucleus . Activation of all the STAT proteins is caused by phosphorylation of a single tyrosine residue that leads to dimerization via an intermolecular SH2 phosphotyrosine interaction [15–18]. The dimerized STATs then translocate to the nucleus where they regulate gene expression by binding directly to high affinity DNA binding sites or by associating with other transcription factors [19–24]. They play a critical role in mediating cytokine and growth factor signaling involved in cell growth, differentiation and survival [25–28]. Among the seven members of mammalian STAT family, STAT3 has been most strongly implicated in oncogenesis . STAT3 is ubiquitously expressed in mammalian cells and is activated by cytokines such as IL-6 family members as well as growth factors such as EGF and PDGF . Transient STAT3 activation is required for astrocytic differentiation . However, the role of STAT3 signaling in adult astrocytes is unclear. Although spontaneous mutations in the STAT3 gene have not been associated with tumorigenesis, constitutively activated STAT3 is found in a wide variety of human tumors including multiple myelomas, breast, ovarian, prostate, and head and neck tumors [31–37]. There is substantial evidence to implicate STAT3 activation in tumor progression. A number of studies have demonstrated that the transformation process induced by diverse oncogenic protein tyrosine kinases is dependent on STAT3 activation [37–39]. Inhibition of STAT3 signaling in a number of tumor cell lines with either small molecular inhibitors to block protein tyrosine kinases (PTKs) or with dominant negative/antisense STAT3 causes a decrease in cell viability and subsequent apoptosis [31, 34, 40]. Elevated STAT3 activity has been shown to render cells resistant to apoptosis by inducing anti-apoptotic genes such as Bcl2, Bcl-xL, and Mcl-1. Recently it has been shown that STAT3 is constitutively activated in astrocytomas . Here we show that knockdown of STAT3 expression by siRNA reduces levels of survivin and Bcl-xL expression and triggers apoptosis in astrocytoma cells. The human astrocytoma cell lines A172 and T98G were obtained from the American Type Culture Collection (Rockville, MD). The U251-MG cell line was graciously donated by Dr. George Perides (Tufts-NEMC). These cell lines were derived from grade IV astrocytomas – glioblastoma multiforme (GBM). Normal human astrocytes (NHA) were obtained from ScienCell (San Diego, CA). A172 and U251-MG cells were cultured in DMEM (ATCC, Rockville, MD) supplemented with 10% FCS. T98G was cultured in MEM (ATCC, Rockville, MD) supplemented with 10% FCS. Normal human astrocytes (NHA) were cultured in astrocyte medium (ScienCell, San Diego, MD). We designed a double stranded siRNA oligonucleotide against STAT3 (5'-AAC AUC UGC CUA GAU CGG CUA dTdT-3'; 3'-dTdT GUA GAC GGA UCU AGC CGA U-5') and had it synthesized by Dharmacon Research, Inc (Lafayette, CO). Oligofectamine (Invitrogen, Carlsbad, CA) was used as the transfection reagent following manufacturer's directions using 200–600 nmol of siRNA per 10 cm dish. Cells were incubated for 24 hrs in Opti-MEM, at which point appropriate media for the cells supplemented with 30% FCS was added. The cells were then incubated for the amount of time indicated in the Figure Legends. For Western blot analysis, cells were harvested and lysed with RIPA buffer (0.15 M NaCl, 1% NP40, 0.01 M desoxycholate, 0.1% SDS, 0.05 M Tris-HCl pH 8.0, 1 mM sodium orthovanadate, 1 mM phenylmethylsulfonyl fluoride, and 10 μg/ml each of aprotinin, pepstatin, and leupeptin). For STAT3 analysis, protein samples were electrophoresed on a 10% SDS-PAGE gels for 90 min. at 150 mV and transferred onto Immobilon membranes (Millipore, Bedford, MA) for 60 min at 100 mV in 10% methanol transfer buffer. For caspase-3 analysis the protein samples were separated on a 15% SDS-PAGE and transferred onto Immobilon membranes (Millipore, Bedford, MA) at 20 mV for 20 min and 80 mV for 2 hrs in 20% methanol transfer buffer. The membranes were then probed with each antibody as indicated. Immunoreactive proteins were visualized using an enhanced chemiluminescence detection system (Amersham Pharmacia Biotech). Anti-phospho-STAT3, anti-STAT3, anti-cleaved Caspase 3, anti-Bcl-xL and anti 42–44 MAP kinase were obtained from Cell Signaling (Beverly, MA). Anti-β-actin antibody was obtained from Sigma (St. Luis, MO). For cell proliferation assays, cells were incubated for 72 hrs in 96-well plates in quadruplicates. Viable cell number was determined by using MTS assay according to the manufacturer's instructions (CellTiter 96 AQ Non-radioactive proliferation kit, Son Luis, CA). The absorbance was measured at 490 nm with a 96-well plate reader. Cells were treated with siRNA as described above. After 96 hours, cells were isolated and stained with annexin V-EGFP (BD Biosciences Clontech, Palo Alto, CA). Cells were analyzed using FACS for fluorescence of annexin V positive cells. The fraction of annexin V positive cells in the siRNA treated population was determined using the super-enhanced DMax method of WinList software (Verity Software House, Topsham, ME). The A172 cell line was treated with STAT3 siRNA as described previously and RNA purified with TRIzol (Invitrogen, Carlsbad, CA). 10 μg of each RNA sample was loaded per well. After transferring onto a nylon membrane (Ambion, Austin, TX), it was probed with a survivin probe (Resgen) or p21 (gift of Sam Lee) labeled with 32P. Hybridizations were performed with Express Hyb (BD Biosciences Clontech, Palo Alto, CA) and washed following the manufacturers protocol. Blots were exposed to Kodak MS film overnight and developed. Blots were then quantitated using a Molecular Dynamics phosphorimager. To determine whether STAT3 is expressed and constitutively activated in astrocytoma cell lines, we compared the level of STAT3 expression and tyrosine 705 STAT3 phosphorylation in normal human astrocytes (NHA) to that of three astrocytoma cell lines. Western Blot analysis with anti-STAT3 and anti-phosphotyrosine STAT3 antibodies revealed that STAT3 was overexpressed and overactivated in astrocytoma cells as compared to primary astrocytes (Figure 1). Reprobing the blot with anti-β-actin shows that variability in protein loading could not account for the observed differences in STAT3 expression. STAT3 is expressed and active in GBM cell lines. 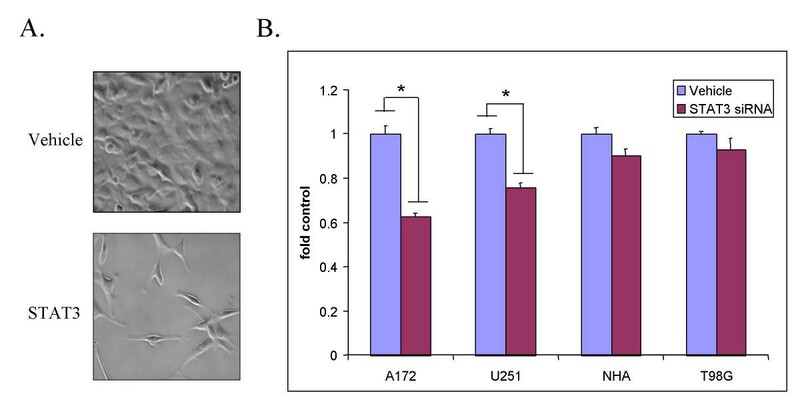 The indicated cell lines were lysed in RIPA buffer after serum starvation for 24 hrs. Cell lysates were subjected to electrophoresis on an SDS PAGE gel and processed for Western blotting with anti-phospho-Tyr-STAT3, anti-STAT3, or anti-β-actin antibodies. NHA are primary human astrocytes. All other cell lines are grade IV astrocytoma (GBM). Recent studies show that constitutive activation of STAT3 in variety of tumors directly contributes to their oncogenic potential by inducing proliferation and inhibiting apoptosis [40, 41]. Thus, we sought to determine the effect of inhibiting STAT3 expression in astrocytoma cells. To inhibit STAT3 expression in astrocytoma cells, we used the RNAi method adapted for mammalian cell culture by Elbashir et al . A number of 21 bp double stranded RNAs to human STAT3 were synthesized and tested for their ability to knockdown STAT3 expression in astrocytomas. 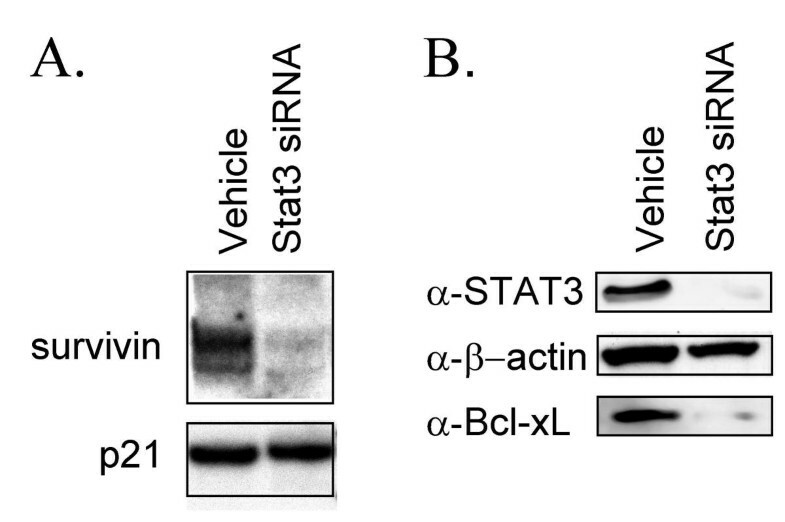 Transfection of cells with one of these STAT3 siRNAs (Figure 2a) resulted in a highly significant and reproducible decrease in STAT3 expression levels as judged by Western Blotting (Figure 2b). The degree of knockdown achieved ranged from 75–95% depending upon the experiment and cell line used. STAT3 siRNA inhibited STAT3 expression in normal human astrocytes (NHA) as well as in astrocytoma cell lines (Figure 2b). Mock transfection with oligofectamine or with an siRNA to the green fluorescent protein (GFP) failed to reduce STAT3 expression. The effect of STAT3 siRNA was specific in that it failed to knock down expression of the unrelated proteins β-actin or Map Kinase. STAT3 knockdown by siRNA was found to be time dependent with the maximum effect achieved at 48–72 hrs of siRNA treatment (Figure 2c). This siRNA is human specific and does not efficiently knockdown expression of murine STAT3 (Data not shown). Knockdown of STAT3 by siRNA in primary human astrocytes and astrocytoma cells. A. Sequences of the synthetic siRNA duplex designed against human STAT3. B. The astrocytoma cell lines A172 and U251 and normal human astrocytes (NHA) cultured in 10 cm plates were transfected with 600 nmol STAT3 siRNA and after 72 hours processed for Western blotting with anti-STAT3 antibodies. The blots were subsequently stripped and reprobed with anti-β-actin or anti-Map Kinase antibodies as controls. C. A172 cells were transfected with 600 nmol STAT3 siRNA for the times indicated and processed for Western blotting with anti-STAT3 antibodies. We noted that upon STAT3 siRNA treatment of some of the astrocytoma lines that cultures were less confluent and some cells became smaller and rounder than control oligofectamine treated cells (Figure 3a). Consistent with this, there were fewer cells in both A172 and U251-MG cultures treated with STAT3 siRNA as compared to control oligofectamine treated cultures 72 hours post transfection (Figure 3b). Transfecting A172 cells a second time with STAT3 siRNA 48 hours after the initial transfection resulted in an even greater reduction in cell number (>90% in A172 and 65% in U251) as compared to oligofectamine controls (data not shown). Viability of normal human astrocytes (NHA) was not significantly affected by STAT3 siRNAi treatment. Another astrocytoma cell line, T98G, was only slightly affected by reductions in STAT3 expression (Figure 3b). Thus, not all astrocytoma cell lines are equally responsive to STAT3 knockdown. The decrease in cell number caused by STAT3 siRNA treatment of astrocytoma cells implies that STAT3 participates in cell cycle progression, cell survival, or both. Staining A172 cells for DNA content after STAT3 siRNA treatment showed an increased proportion of cells in early S phase (data not shown). This could be due to an S phase cell cycle block or to preferential apoptosis of these cells in late S and G2/M. STAT3 siRNA causes a decrease in cell number in glioblastoma cell lines. A. A172 cells were transfected with a STAT3 siRNA (bottom panel) or a control siRNA (top panel). Cells were photographed 72 hours post transfection at 200× magnification. B. A172, U251, T98G, and NHA cells were transfected with STAT3 siRNA or mock transfected with oligofectamine (vehicle). Viable cell numbers were determined by MTS assay 72 hours after transfection. (*) indicates a P value <0.001. The cell number decreases observed in conjunction with the morphological observations suggested that astrocytoma cells treated with STAT3 siRNA undergo apoptosis. To confirm that these cells undergo apoptosis in response to STAT3 knockdown, we examined three other indicators of apoptosis in the A172 cell line. First, cultures of astrocytoma cells were stained Hoechst 33258 dye and scored for apoptotic nuclei. A significantly higher percentage of apoptotic nuclei were observed in STAT3 siRNA treated cells than in GFP siRNA or oligofectamine treated cells (Figure 4a). Consistent with this observation, Western blot analysis of astrocytoma cell extracts showed that there is increased cleavage of caspase 3 in STAT3 siRNA treated cells (Figure 4b). 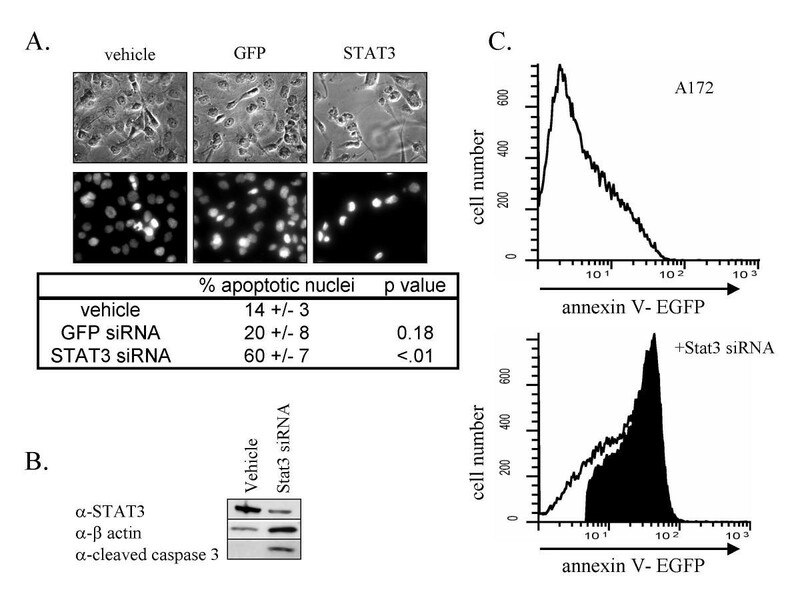 Finally, annexin V staining of control and STAT3 siRNA treated cells followed by fluorescence activated cell sorting analysis indicated a 77% increase in the fraction of annexin V positive cells, further confirming that these cells are undergoing apoptosis (Figure 4c). Together these data indicate that STAT3 regulates an anti-apoptotic program in astrocytomas and that inactivation of STAT3 leads to a rapid induction of apoptosis. Induction of apoptosis in human astrocytomas by STAT3 RNAi. A. A172 cells were transfected with STAT3, GFP siRNAs, or mock transfected with oligofectamine (vehicle). After 72 hrs, cells were fixed in 4% paraformaldehyde and stained with 25 μg/ml Hoechst 33258 dye to visualize apoptotic nuclei. The percentage of apoptotic cells (small bright nucleus) was determined for each of the treatments by counting five visual fields and at least 100 cells. B. A172 cells were transfected with STAT3 siRNA or mock transfected with oligofectamine. Western blotting was performed 72 hrs post transfection. Blots were probed with α-STAT3, α-cleaved caspase 3 and α-β-actin antibodies. C. A172 cells were transfected with STAT3 siRNA (bottom panel) or mock transfected with oligofectamine (top panel). After 96 hours, cells were isolated and immunostained with EGFP coupled anti-annexin V antibody. Cells were sorted by FACS and annexin V positive cells counted. The region shaded in black (77%) corresponds the increase in annexin V positive cells relative to the mock transfected cells. Recent data indicate that constitutive activation of STAT3 induces the expression of a number of anti-apoptotic genes including Bcl-xL, a member of the Bcl-2-family of anti-apoptotic genes [32, 45], and survivin, a member of the IAP, inhibitors of apoptotic proteins family . Moreover, both of these genes are expressed in astrocytomas [47, 48]. In order to determine whether these two genes might be involved in the STAT3 mediated apoptotic block in astrocytoma, Northern and Western blot analyses were performed to examine the expression levels of these two genes. Northern blot analysis showed that STAT3 siRNA reduced expression of survivin by 75% (Figure 5a). Western blot analysis showed that Bcl-xL protein levels were drastically reduced upon treatment with STAT3 siRNA. Thus, these data show that STAT3 regulates the expression of at least two distinct antiapoptotic genes in the A172 cell line. STAT3 controls expression of survivin and Bcl-xL in the A172 human glioblastoma cell line. A. A172 cells were transfected with STAT3 siRNA or mock transfected with oligofectamine. After 72 hours, RNA was isolated from the cells and then analyzed by northern blotting for survivin and p21 mRNA. B. A172 cells were transfected with STAT3 siRNA or mock transfected with oligofectamine. After 72 hrs, STAT3. β-actin, and Bcl-xL expression levels were analyzed by Western blotting. STAT3 is activated by a number of cytokines and growth factors and has diverse functions during embryogenesis and early development [25–28]. Due to the transient nature of cytokine and growth factor signaling and the presence of proteins such as SOCS, suppressor of cytokine signaling, and PIAS, protein inhibitor of activated STAT, that inhibit of STAT3 signaling, STAT3 activation under normal physiological conditions is transient, lasting anywhere from several minutes to several hours . However, during tumorigenesis there is often constitutive activation of PTKs due to activating mutations or aberrant growth factor or cytokine signaling. Constitutive PTK signaling results in constitutive activation of STAT3. It is therefore not surprising that recent studies show that there is persistent activation of STAT3 in a number of human cancers including multiple myelomas, breast, ovarian and prostate carcinomas and head and neck tumors [32–37]. The initial evidence that STAT3 signaling is critical to tumorigenesis came from the observation that activation of STAT3 is necessary for v-src induced transformation of NIH3T3 cells [38, 39]. Subsequent studies have shown that STAT3 activation is crucial to cellular transformation induced by a number of viral oncogenes . Inhibition of STAT3 signaling with either dominant negative or antisense oligonucleotides against STAT3 suppresses the transformation process in some tumors [34, 50]. Overexpression of a constitutively active mutant of STAT3 transforms 3T3 cells in culture . Finally, recent studies have shown that treatment of tumor cells with inhibitors of STAT signaling results in decreased cell viability and induces apoptosis [40, 41]. Together these findings demonstrate that STAT3 signaling plays a critical role in both the transformation process and tumor progression in some types of cancer. Ourselves and others have found STAT3 is constitutively activated in astrocytomas and astrocytoma cell lines [41, 52]. This is consistent with the fact that human astrocytomas are often characterized by an amplification of either growth factor genes, such as PDGF, growth factor receptor genes, such as the EGF receptor, or cytokines such as IL-6 that can lead to constitutive activation of STAT3 [53, 54]. Not surprisingly, there was constitutive STAT3 activation in all astrocytoma cell lines tested. In contrast, NHA showed relatively little STAT3 expression and activation. In order to determine the role of STAT3 in astrocytomas directly, we have used RNAi to specifically knock down the expression of STAT3 in several human astrocytomas. Treatment of astrocytoma cell lines with STAT3 siRNA resulted in morphologic and biochemical changes indicative of apoptosis. These results are consistent with results previously observed with dominant negative STAT3 in U251 cells . Although STAT3 siRNA decreased the amount of STAT3 present in NHA, it did not have a significant effect on their viability. This suggests that STAT3 may be an ideal target for cancer therapy since inhibition of STAT3 signaling induces tumor cell death, but does not kill normal astrocytes. One mechanism by which STAT3 participates in tumorigenesis is by inhibiting apoptosis through the induction of anti-apoptotic genes. Biochemical studies have shown that astrocytoma cells express a number of death receptors but are resistant to death receptor mediated apoptosis [55, 56]. Other studies have shown that survivin is overexpressed in some tumors and that overexpression of the gene is sufficient to block apoptosis in tumor cells [48, 57, 58]. We have found that both Bcl-xL, a member of the BCL2 family of proteins, and survivin are expressed in A172 cells (Figure 5a &5b). Treating A172 cells with STAT3 siRNA significantly reduces expression levels of both of these genes. STAT3 responsive elements are found in the promoter region of both of these genes, suggesting that they are directly regulated by STAT3 [32, 46]. Our findings that Bcl-xL is regulated by STAT3 in astrocytoma cell lines is consistent with previous data . We are the first to report that STAT3 also regulates survivin expression in astrocytoma. Taken together with our data that knockdown of STAT3 can induce apoptosis, these findings suggest that induction of Bcl-xL and survivin genes by constitutively activated STAT3 promotes survival of astrocytoma cells. Not all the astrocytoma cell lines examined responded equally to STAT3 knockdown. This suggests that some astrocytomas are not dependent on STAT3 for survival. Further work is needed to determine whether this STAT3 independence has evolved from STAT3 dependent cells or more likely is a result of the specific types of oncogenic mutations in these tumors. Data presented in this paper are consistent with the growing body of evidence suggesting STAT3 may be an important therapeutic target in tumors including astrocytoma. We are the first to report that an siRNA can induce apoptosis of astrocytoma cells. siRNAs are short oligonucleotides of 21–23 nucleotides in length that can be used in vitro to produce sequence specific gene silencing of mammalian cells . It has been shown that siRNAs can be used effectively in vivo to suppress gene expression in adult mice [60, 61]. siRNAs can be directly introduced into the CNS to reduce endogenous gene expression . These results suggest that siRNA may become a useful clinical tool in the future. Since STAT3 signaling is important for the survival of a number of human tumors, STAT3 siRNA could become an effective therapeutic agent for STAT3 dependent tumors. Knockdown of STAT3 expression by RNAi results in a reduction in expression of Bcl-xL and survivin in A172 cells and leads to induction of apoptosis in this and other astrocytoma cell lines. This work was supported by NIH grant GM51551 to BHC. LK was supported by Medical Scientist training grant NIH T32 GM08448. BHC and LK conceived and designed the experiments and wrote the manuscript. LK performed most of the experiments. MK performed and interpreted the FACS analysis. MMK helped with siRNA experiments, northern blots, and tissue culture. All authors read and approved the final manuscript.